0400 Arrival in Baguio. Proceed via rented jeepney to Kibungan. 0930 ETA Tanap road side (900 MASL). Start trek. 1230 Arrival at Palpalay-yen pine forest (1100 MASL). Lunch. 1200 Lunch at Bato view deck (1330 MASL). 1400 ETA Mayos river. Washup. 1700 Back at Poblacion. Tidy up. This is the continuation of my previous post "Mt. 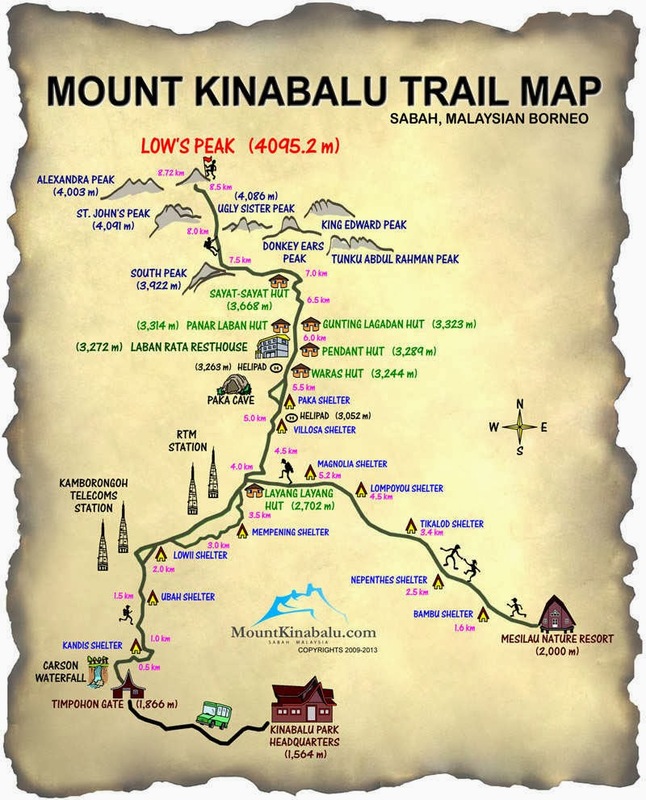 Kinabalu." I'm telling this once again, one of the best parts of my passion to climb is the exciting "add on" of being able to travel. We intended to spare one more day to do some side trips after the climb. Here's a short post of our side trip. It was a fine morning and we could hardly move our legs. 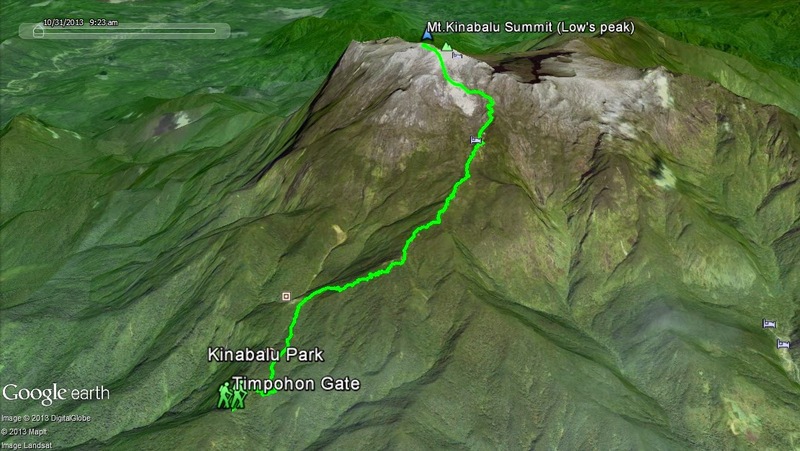 It was our fourth day in Kota Kinabalu and being fresh from the climb, everybody was having muscle pains. LOL. Well, we still managed to walk around the city without the assistance of any cab or bus. Just plain walking. Because half of us were able to roam on their first day, they were already familiar. The city is free of heavy traffic and is relatively small yet still very progressive and busy. We visited some malls and ate our lunch in an Indonesian restaurant. We visited some landmarks like the Atkinson Clock Tower and viewed the sunset at Marina. We bought pasalubong at a nearby market. 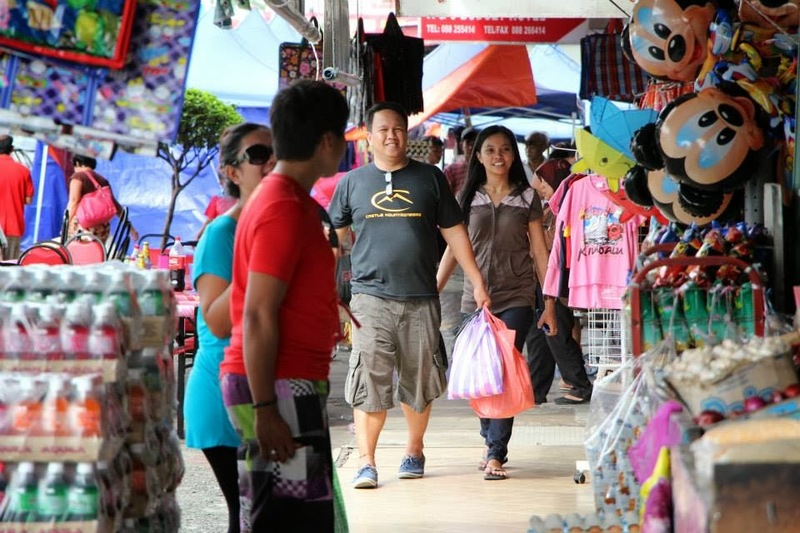 We spotted some Filipino vendors there. Actually, it felt like we were just visiting a place in Southern Philippines. The Muslim communities are very much the same with those in Mindanao. 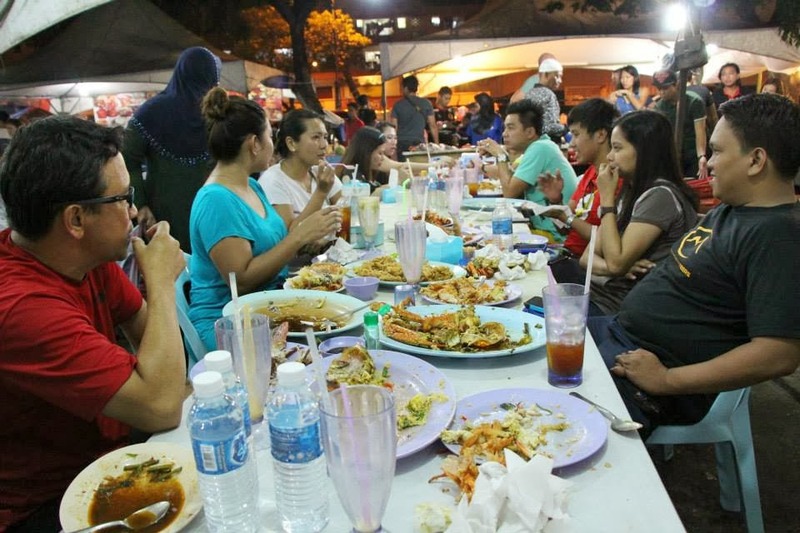 The feature of people which is Malay is very Filipino. 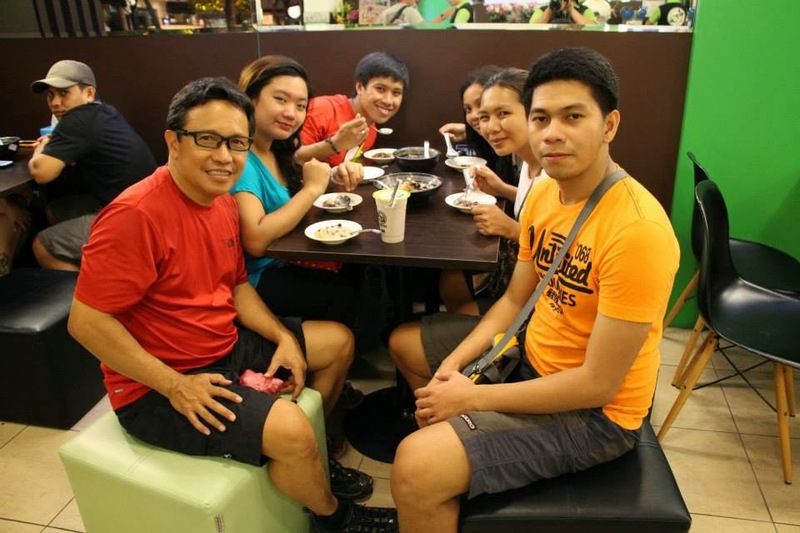 Some Filipinos that we met even migrated there to work or build small businesses. The only that is far different from The Philippines is that their cars follow left-hand driving. 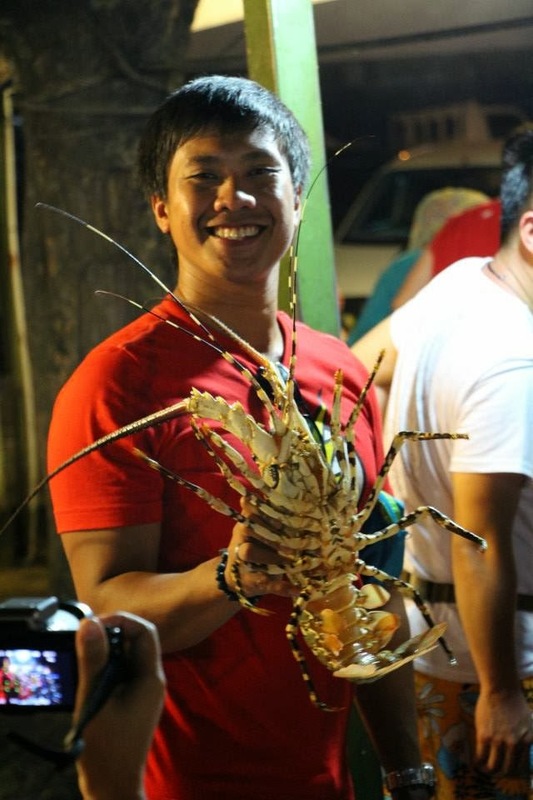 We had a seafood feast at night for our dinner and it was my first time to eat a lobster. Everybody was full. We had some bonding and walkathon going back home but we never felt the tiredness and pain. We dropped by at a small convenience store and ate ice cream (thanks sir Frank for the treat!). But we didn’t settle for that, sir Frank gave us a dessert treat again at a nearby store, just few steps away for our lodge. By the way, we stayed at Kota Kinabalu Backpackers Lodge at Lorong Dewan. It was clean practical and "sulit" dorm type lodge for a short stay of a team. They also serve complimentary breakfast. 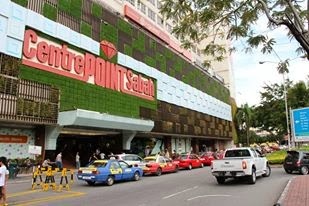 Actually, if this was not just a side trip, we could have gone to more places in Kota Kinabalu. Somebody offered us to do some island hopping. We're even told that there's a seafood restaurant with a cultural presentation (but this is not so near from the city proper). Given a limited time, we just enjoyed what we can do within the city. It was a big check to my list of mountain targets. It was my first ever international climb. Finally, the vision of climbing Mt. 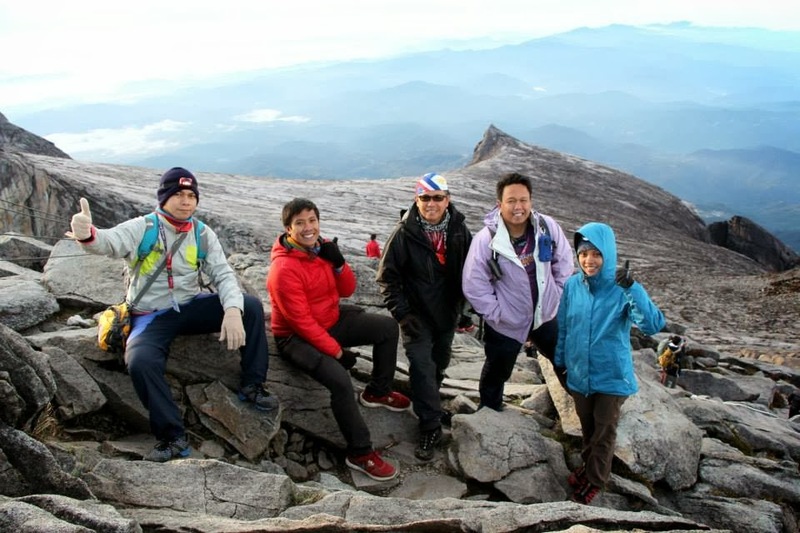 Kinabalu in Malaysia materialized! 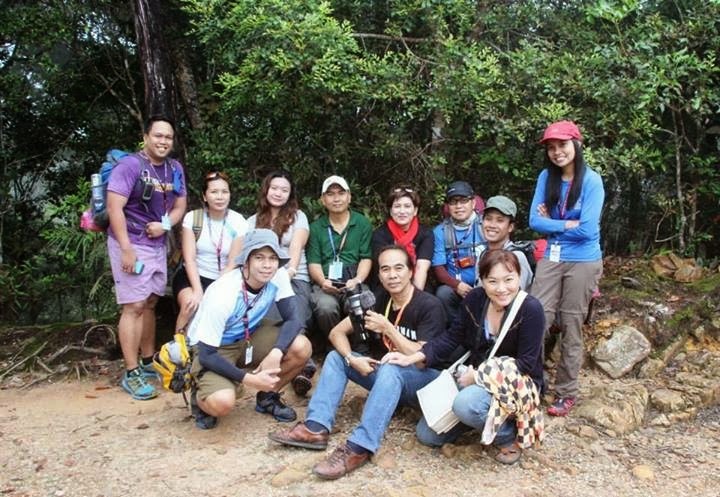 Early 2013 when I invited some of my close friends in the Lingkod community to join me and Buddy Dennis in our pursuit to reach the said mountain. Yes, it was my initiative and therefore I was the primary organizer of this climb event. Mt. 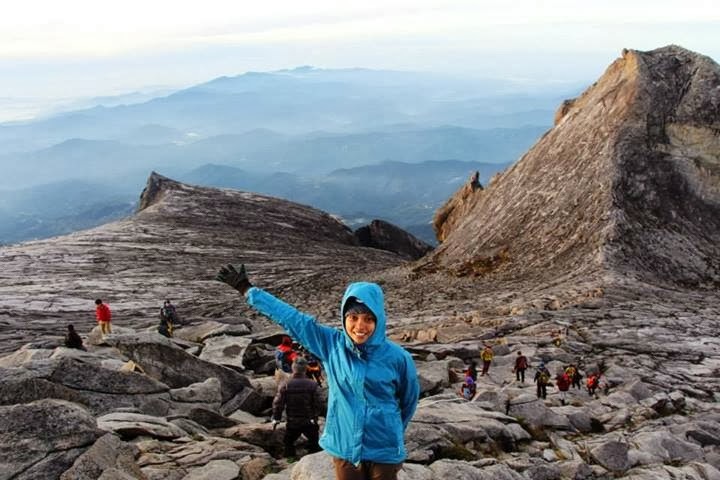 Kinabalu is the highest mountain in Southeast Asia towering Sabah, Malaysia (Borneo Island) at 4,095 meters above sea level and the 20th highest mountain in the world.It's located and protected in Kinabalu National Park, a UNESCO World Heritage Site. Obviously it’s higher than Mt. Apo, the highest in the Philippines. 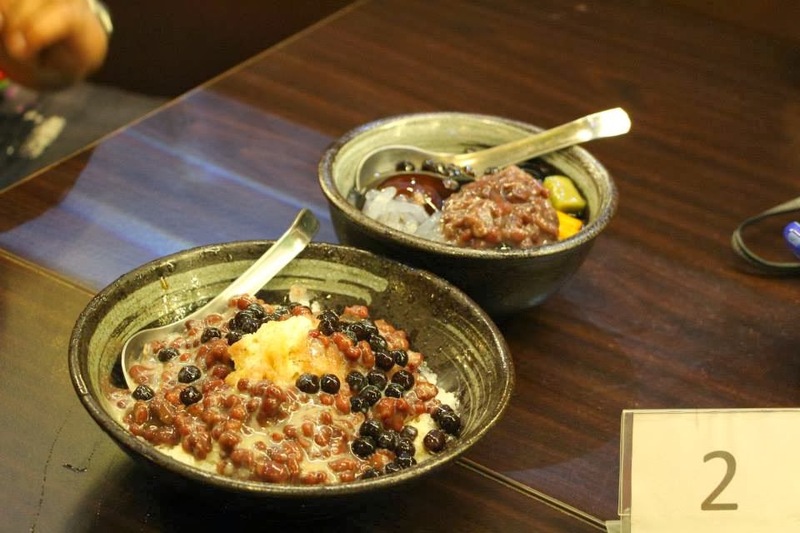 One of the said legends tells that the name was originated from the Chinese Widow (“Kina” and “Balu’). 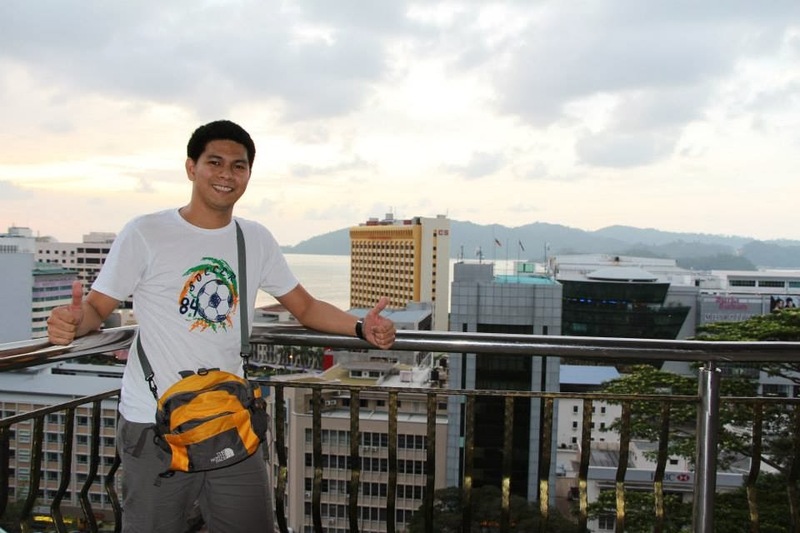 It’s a story of a Chinese man who went to Kota Kinabalu, met and loved a woman but eventually went back to China. He made a promise to come back but it never happened. The woman was left lonely, so in loneliness and with a significant time of waiting” ascended to the mountain and eventually died there. Well, this is only one of the recognized tales. 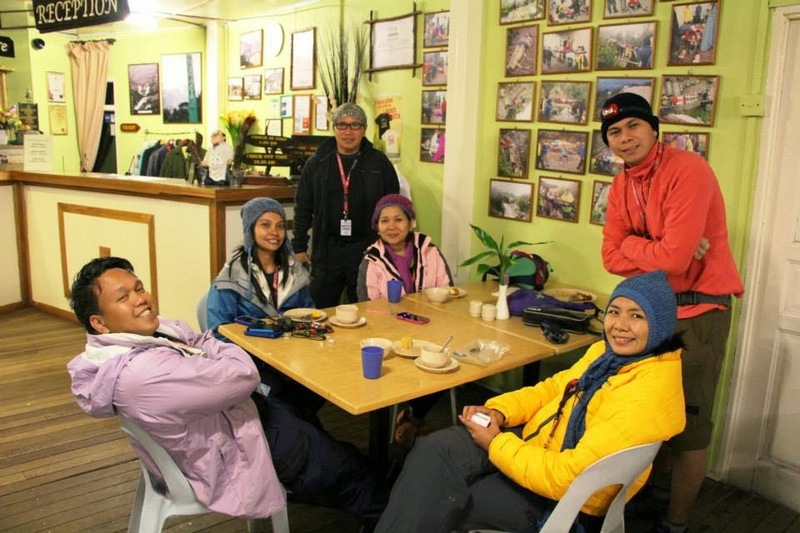 For the Filipino mountaineers, they say, it’s the first step to give an alpine climbing a try. Although it doesn’t snow in Mt. Kinabalu, and I guess, it really won’t, being situated in a tropical country. Organizing the event wasn’t easy. I can say it was a preparation of almost a year (three-fourths of the year to be exact). In the middle of the preparation, I almost regretted at taking the head of the event. The target number to create our team was maximum of 12 persons in order to achieve saving costs of the trip. Some were unsure, some expressed the desires but didn’t actually join, some of the concerns were the conflict of schedules and some talked about the budget which was very crucial since we are talking about setting and reserving an international climb and it involves a big amount of money. Our set schedule was the long weekend in October to November wherein two days of it would probably be declared as holidays because of the All Saints Day which comes before the weekend. The first main step for us was to look for a discounted air fare. It was only in April or May when Buddy and I got the one-way ticket while some of us got round trip tickets in June. Luckily, we also got the corresponding one-way return tickets on the same month. After booking, there was no way to turn our backs. The next step was the reservation of the climb itself. This involved identifying first what exactly we are going to do. We didn’t settle for the usual/normal climb. We wanted a Ferrata activity. 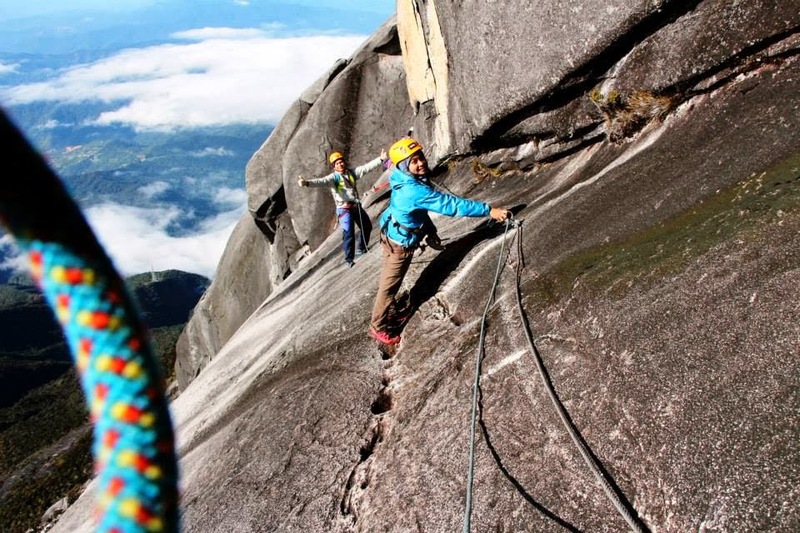 Via Ferrata is an add-on activity managed by the Mountain Torq which to my first understanding, includes rock climbing and rappelling with safe equipments. It might be our first and last visit there and we wanted to experience it to maximize our climb. 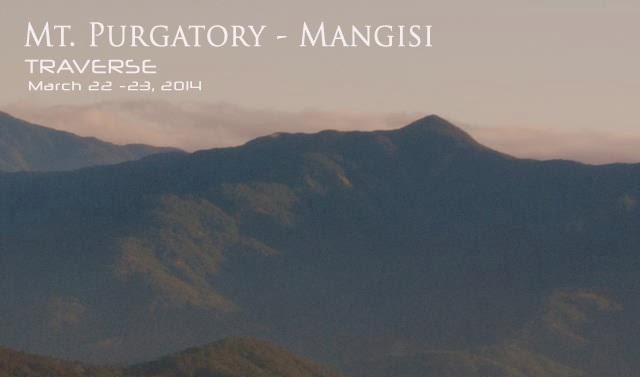 According to my friend who went there two years ago and did the usual back and forth climb, it should be the Sutera Lodges to keep in touch with. Here’s the website/link of the Sutera where you can acquire all the information you need. Another friend of ours who did the Ferrata early 2013 told me that it must be the Mountain Torq to inquire with. I got in touch with the Mountain Torq and let them know our desired schedule of climb. We never settled that easy as our team didn’t agree right away. Good thing we made it happen to meet for a pre-climb meeting to discuss all the concerns. It was in July. The main concern was the budget. What also got me worried was that, we had to make full payment before the actual climb and we had to do it online. It was obviously more costly to avail the ferrata package. The sure participants that time was nine but two of us decided to back out. Thankfully, majority of us were very determined to join and ended up as seven participants to make the team. We were not able to get replies from Mountain Torq anymore when we reverted to them. Perhaps, the slots were no longer available. However I remembered what our friend mentioned (the one who gave us the Mountain Torq idea), that this Mountain Torq would eventually endorse us to a travel agency. We googled and did further research. Thank heavens as Buddy Dennis found the Amazing Borneo Tours. 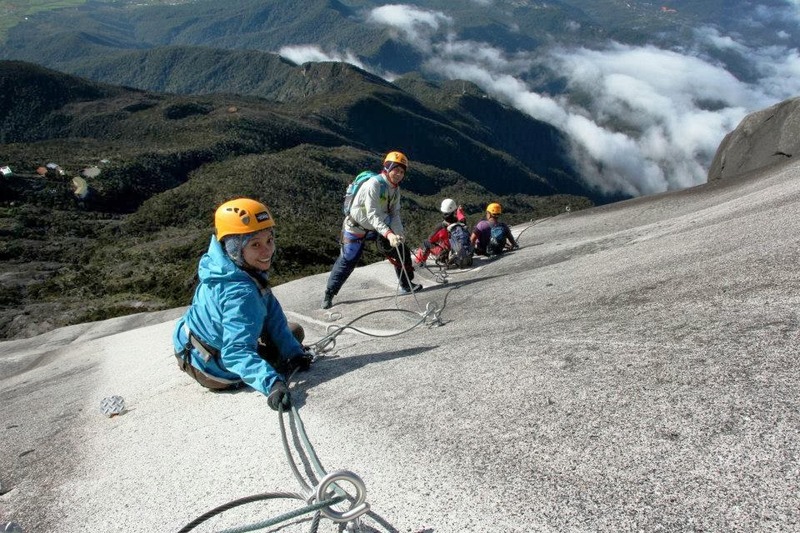 They have a reasonable ferrata package although it excludes the permit fees and other basic climb fees. When we compared it with the case of arranging it on our own, it’s almost the same. So we decided to pay them for arranging those fees. This gave us convenience because all we got to do was to climb. By the way, we had a good experience with Amazing Borneo Tours. During the duration of reservations, payments and inquiries, they were easy to communicate with and they delivered good service when we got there in our actual trip (i.e. picking us up from the airport and taking us back there). The only thing that was never given to our favour was the non-refundable down payment of our supposed to be companion (eighth participant) who backed out one month before the climb, although I still understand since it was in their policy. (Friendly reminder: Ensure that you got only the sure participants/companions to avoid this hassle. It was actually financial matters that was really very crucial). As you can see, we had to act as a group to avail the discount for 7-15pax. We were a group of 7 persons. 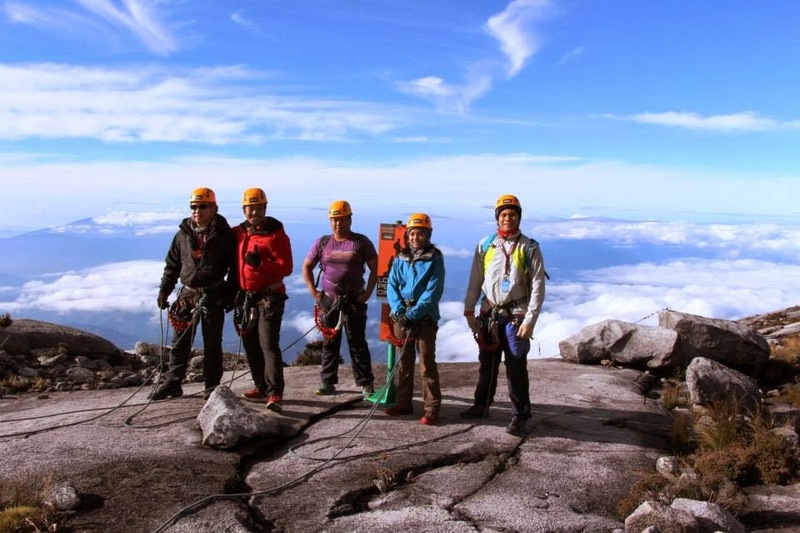 Four of us were ahead of flight schedule and so four of them were able to go around the Kota Kinabalu City prior to the climb. As for the rest of the team which included me, it was only at 2am of October 31 when we arrived at Kota Kinabalu International Airport and we spent our time/slept there until Amazing Borneo bus fetched us at 6am and afterwards, those who were already checked in at a lodge inside the Kota Kinabalu City. Day 1 of our climb started! I think we were the only team they served on that day. 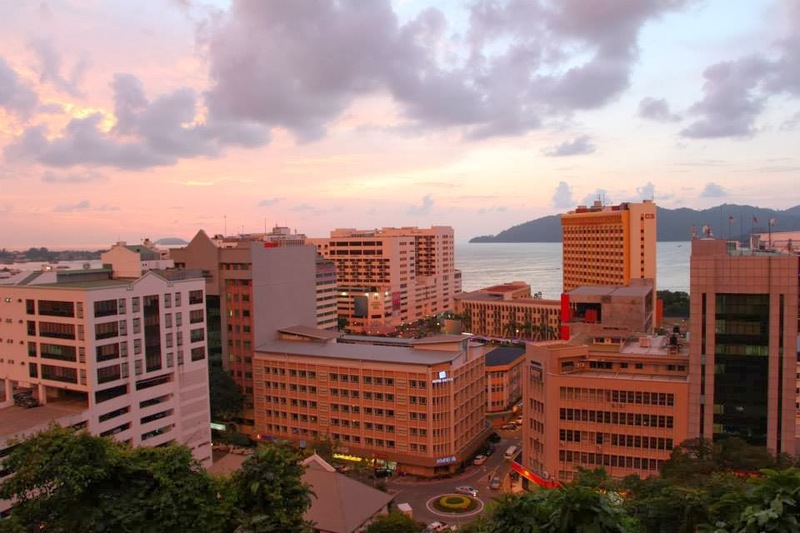 From Kota Kinabalu City is a 3-hour drive to the Mt. 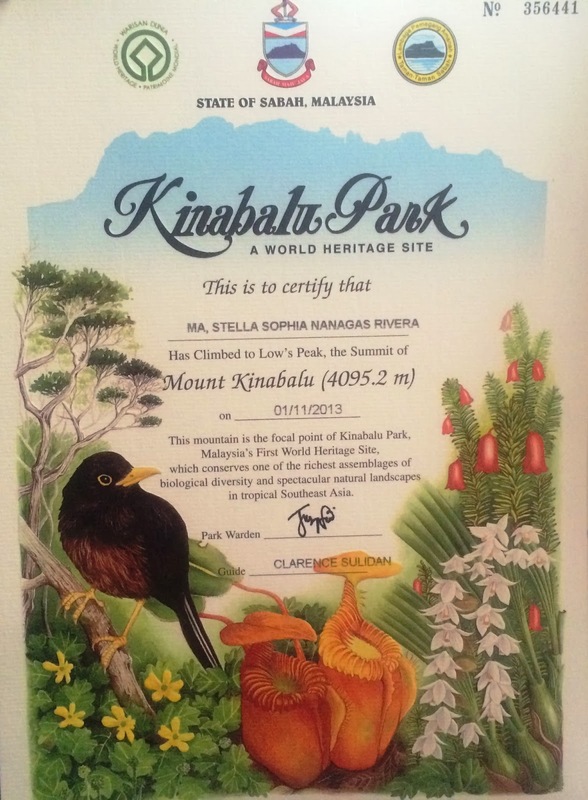 Kinabalu Park. When we passed by the portion where the entire Mt. 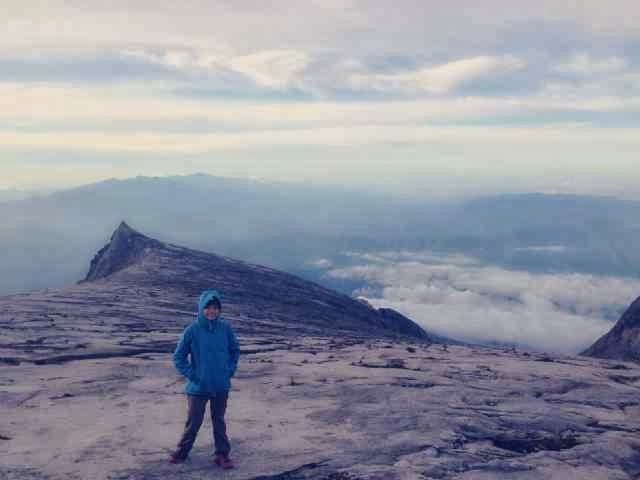 Kinabalu can be viewed, I was in awe. It's such a very huge mountain rock and it's beautiful. When we arrived at the park, it was cold already and we waited for our guide and porters. We saw many climbers of different nationalities. It was my first time to climb a mountain encountering a lot of climbers from different parts of the world. We were picked up by another Amazing Borneo staff and was given another ride to the starting point. He also gave us our packed lunch which is included in our Ferrata package. We started our trek in Timpohon gate. We intended to do a traverse but due to time constraints and probably tired bodies on the second day, we did not actually do the traverse via Mesilau trail (which will be discussed later on this post). 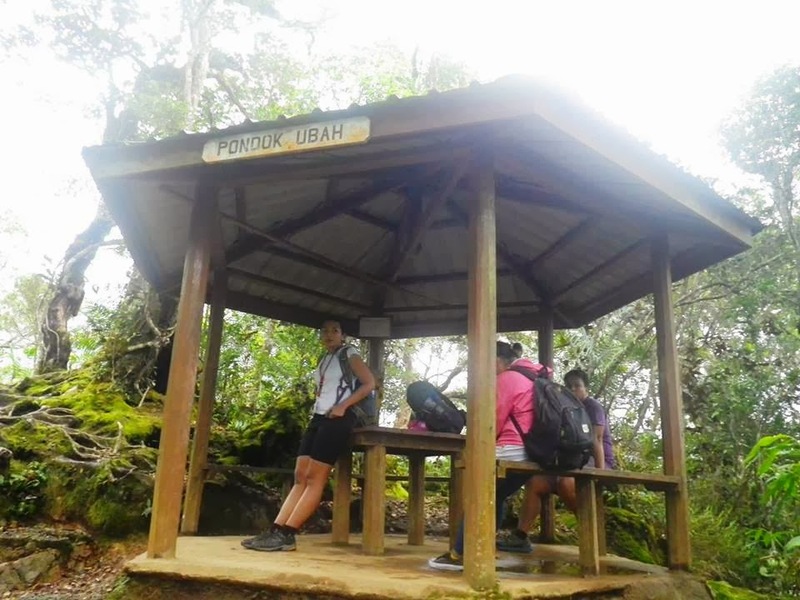 Some of the mountaineers I talked with and other sources advised us to ascend thru to Timpohon because it is shorter than Mesilau trail and the fact that we have a cut off time to beat (3pm for the Ferrata briefing and summit assault at Pendant Hut), Timpohon is more practical. Mesilau is 2 kilometers longer than Timpohon. The trail is established and not technical and if you had a good preparation and warm up, you can say that it is relatively easy. However it is still steep just like any mountain. The first two of us in the team took us 6 hours to reach the Pendant and I was actually nervous because I thought we won’t get there at the cut off time. 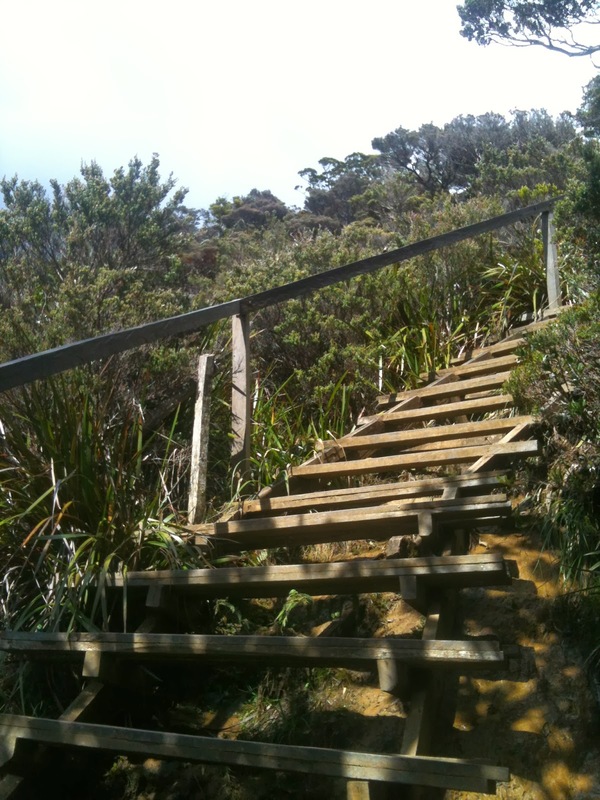 There are parts of the trail with built in stairs made of woods and even with hand rails. 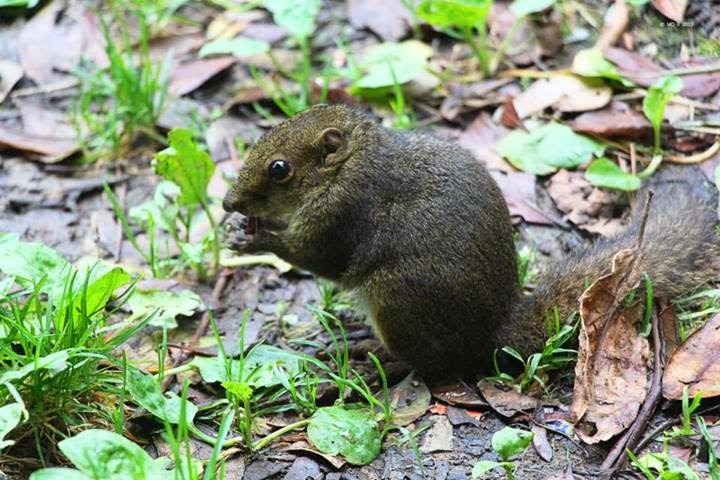 What also amused us was the presence of squirrels which are not in fear of climbers but instead almost getting closer waiting for any trail food to be shared with them. We also had the chance to get along with some Thai people who said they are TV crew documenting the Kinabalu Park but I think they intended only to reach fewer/lower parts. It was a great experience to meet and greet ascending and descending fellow Asians, Europeans and Australian climbers. Some of the Malaysian people that we met mistakenly saw us as Malays (because of the same features). The total kilometers that we trekked until Pendant Hut were 8.72 kilometers. There is one shelter where you can rest after every one or two kilometer-walk. Since I didn’t get enough training for this (my last climb was in early August and I didn’t get the chance to have at least a training run), I endured a lot of muscle pains. The point at which we were at more than 2000MASL, it’s seriously getting colder and we seemed to breathe with thinner air. At around 1am, it rained and according to the guide, it is a normal case there and it’s not because we're having a bad weather. 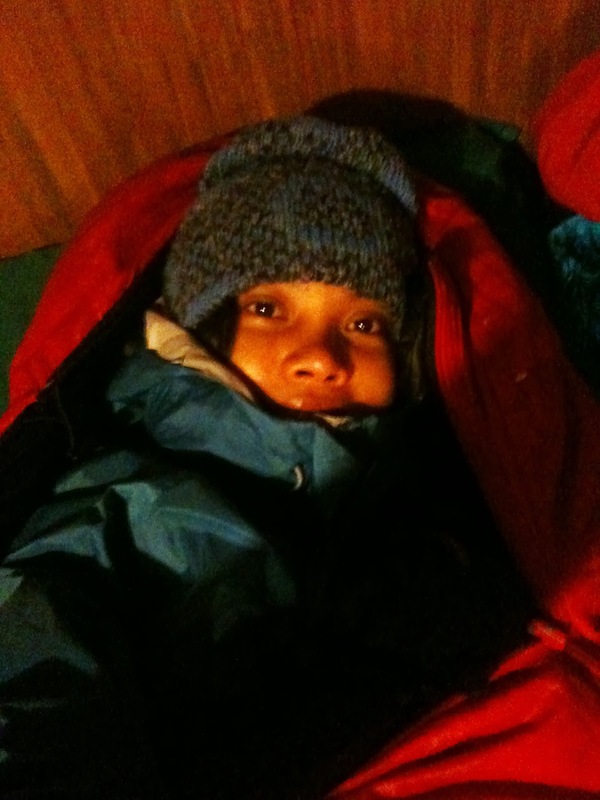 It was very cold when we reached the pendant hut. It was also the point where Sutera Lodges are. An amazing view of huge rock mountain peak wowed us as we catch our breath ascending more to the Pendant Hut. It is what we would be climbing on the next day to reach the summit although the summit is not yet visible from there. 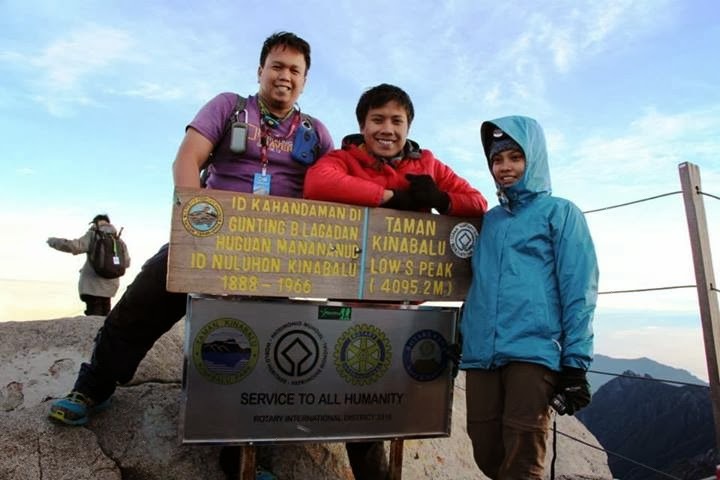 Paulo and I were the first two in our team to reach it. We decided to get there faster to ensure that at least two of our team beat the cut off time, we were actually 30-minute late. We arrived at 3:30PM. The staff there started to discuss the briefing to the first 5 other foreign climbers so we were just told to wait for the rest of the team (and the rest should at least arrive by 4pm). We’re the second batch to listen to the briefing. We were taught step by step procedures on how to use the rope and act as a team. I’m not good in rock climbing so I was a little scared for tomorrow. I was just afraid to make a mistake. 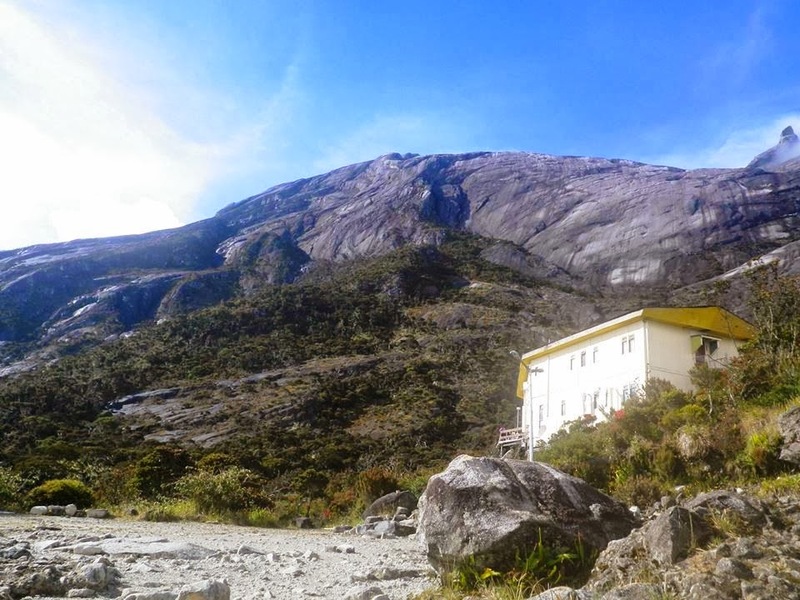 After that, we proceeded to the Sutera Lodges (as far as I know, it’s where to stay at for those climbers who won’t be doing the Ferrata). It’s just 10minutes away from Pendant Hut. 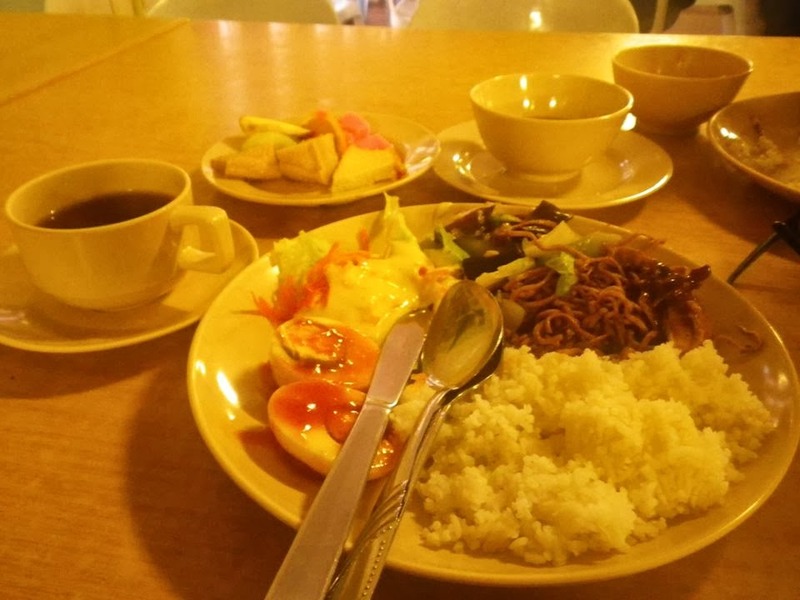 It was a buffet type dinner and it is served early because the wake up call the next day would be before 2am for the summit assault to chase for the sunrise. But even if we knew that a beautiful sunrise could await us for tomorrow, a very beautiful sunset from there during that time initially amazed us. It was really a beautiful and very touching view. 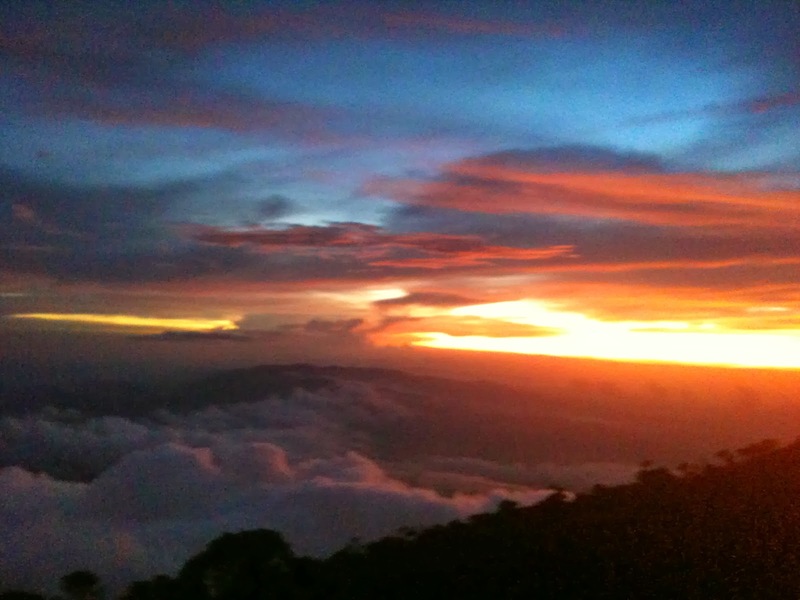 a dramatic and breathtaking sunset..
We went back to Pendant Hut to get ready for rest and sleep. 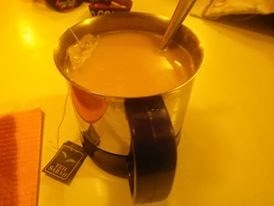 I enjoyed the hot Sabah tea mixed with milk/creamer. I really liked it that I drank many cups of it the entire duration of our stay. It was very perfect and soothing for a cold place like that. Seven of us occupied one dorm-type room with 4 double decks. 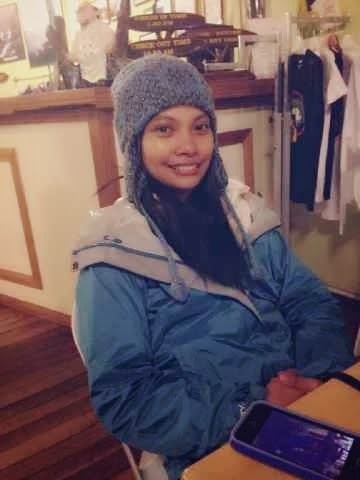 Another Filipina climber also joined us, Vanessa (whom we were able to meet earlier at the airport, but she was under a different travel agency. So we’re a total of 8 persons in the room. I prepared myself for such cold night so I wrapped myself with 2 jackets, hoods and bonnets that when I woke up, I really got perspired. I thought I was over reacting but I guess it’s better than to leave myself unguarded from the coldness of the temperature. Generally, the room we occupied in the Pendant Hut is warm and comfortable. Beddings are also provided. 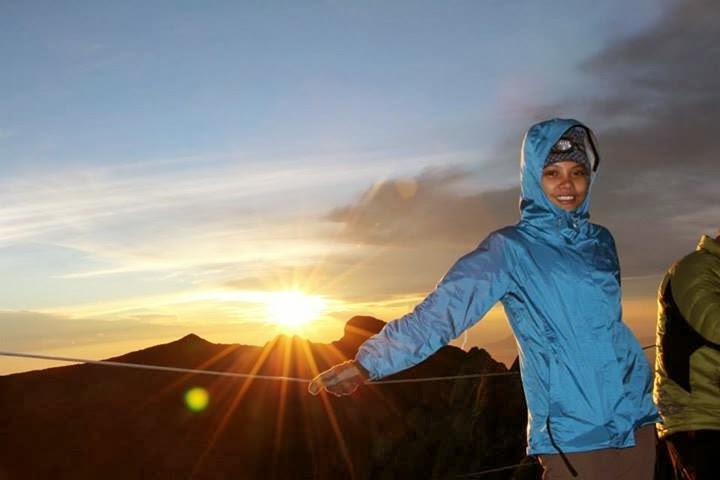 We woke up at 1:30 am, breakfast was ready already and after preparing the necessary things for the summit assault, we were fetched by the guides. The trail is a continuous ascent with some part of the trail with built-in stairways. Few meters to reach the Sayat-Sayat Hut, the trail that we have to ascend have some assisting ropes. Even though we don’t have heavy loads, it is still tiring since it seems like a nonstop ascent and deprivation of oxygen are major factors to difficulty in breathing. I got some colds and it’s kinda hurtful to my nose, well that’s my experience. We reached the point that everything around is an open rock trail. The sun gave us a hint that it shall start rising. The low’s peak is the very summit of the mountain and before reaching it, you have to climb a pile of large rocks. There are already many climbers at the top especially the Koreans. Whew! I got to reach it. Via Ferrata in Mt. 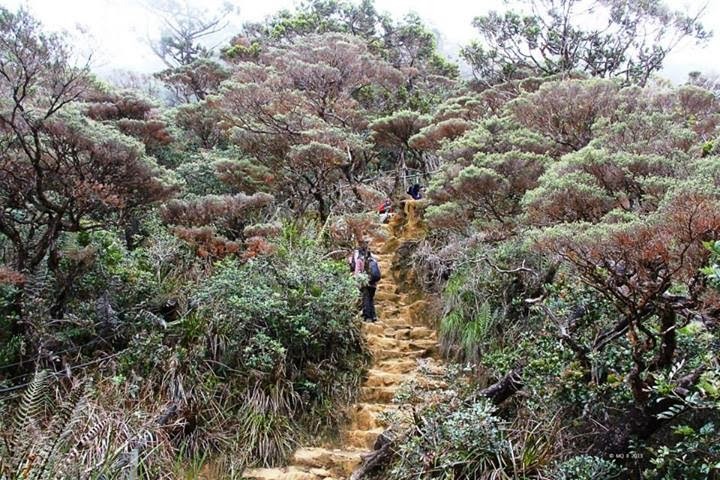 Kinabalu, as mentioned is managed by Mountain Torq, is said to be world’s highest one. A via ferrata (Italian for "iron road", plural vie ferrate or in English via ferratas ) is a protected climbing route found in the Alps and certain other locations. 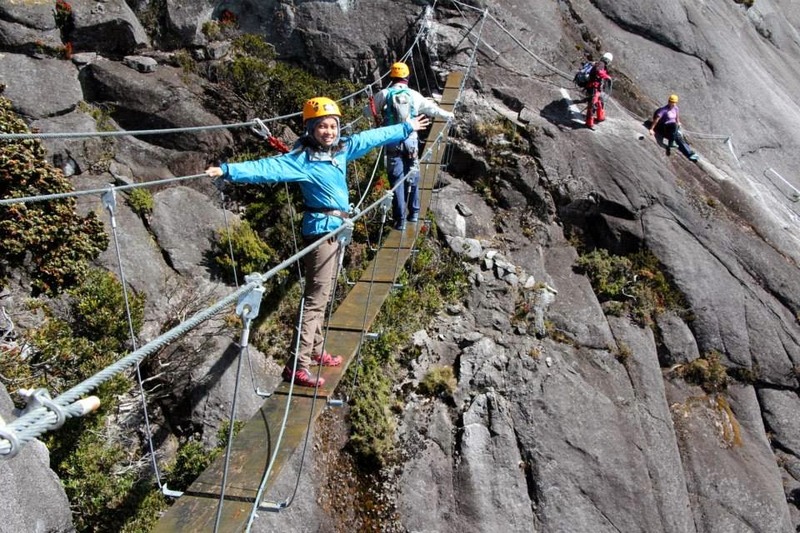 The essence of a modern via ferrata is a steel cable which runs along the route and is periodically (every 3 to 10 metres (9.8 to 33 ft)) fixed to the rock. Using a via ferrata kit, climbers can secure themselves to the cable, limiting any fall. The cable can also be used as aid to climbing, and additional climbing aids, such as iron rungs (stemples), pegs, carved steps and even ladders and bridges are often provided. Thus via ferrata allow otherwise dangerous routes to be undertaken without the risks associated with unprotected scrambling and climbing or need for climbing equipment (e.g. ropes). 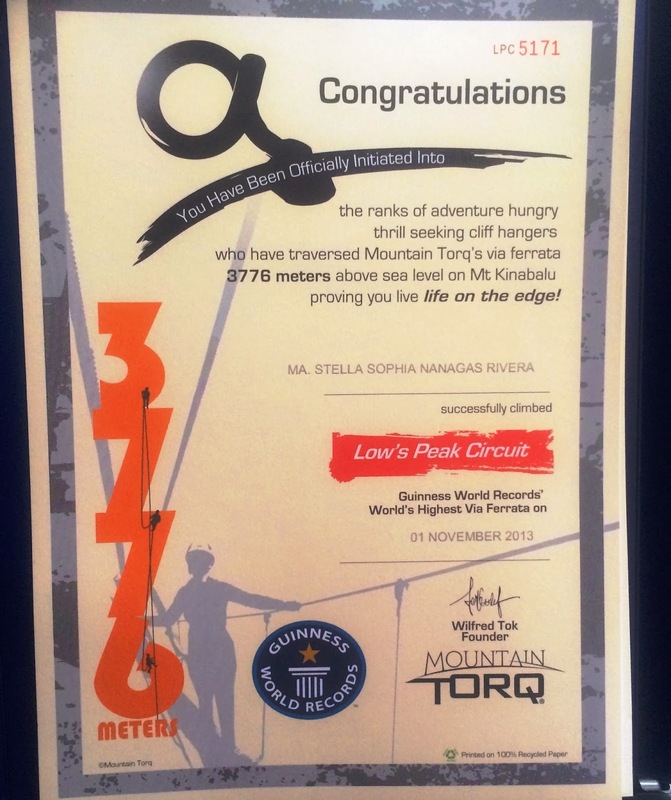 Mountain Torq’s via Ferrata has two types: Walk the Torq and Low’s Peak Circuit. Walk the torq is shorter than the Low’s Peak circuit. We opted to do the Low’s peak circuit so our package contains that. Being tired from the summit assault on that dawn, it wasn’t easy to finish the circuit. But it was quite fun. Although it was sort of nerve wrecking for me, it was indeed fun and full of adventures activity. In here, we’re protected by harness, and you will do the step by step transfer of the rope in order for your team to move (it was like we’re doing it for 3 hours that some of us were joking that such steps that we seemed to master already will be brought to our dreams when we sleep). I was nervous because it was steep and my gloves are very slippery to hold on to the wire ropes. I decided not to use gloves. Although it’s hurtful to the hands, I think it’s better as I gained more confidence because I know my hands will not slip away. It was fun because as we do the descent via the wire ropes, we were doing some conversations and teasing each other. We found out that these Malaysian guides were able to watch some of the Filipino teleseryes that they imported from the Philippines like Mula sa Puso and Pangako Sa’yo. LOL. While doing this, our safety was assured by them and we also took care of our own selves while moving. We crossed the other rocks through a monkey bridge adding more adventure to the activity. We were told to let go of the ropes and bend backward from the wall rock . It was hard for me. The guide told to me meaningfully, “you have to learn to let go!” aww! 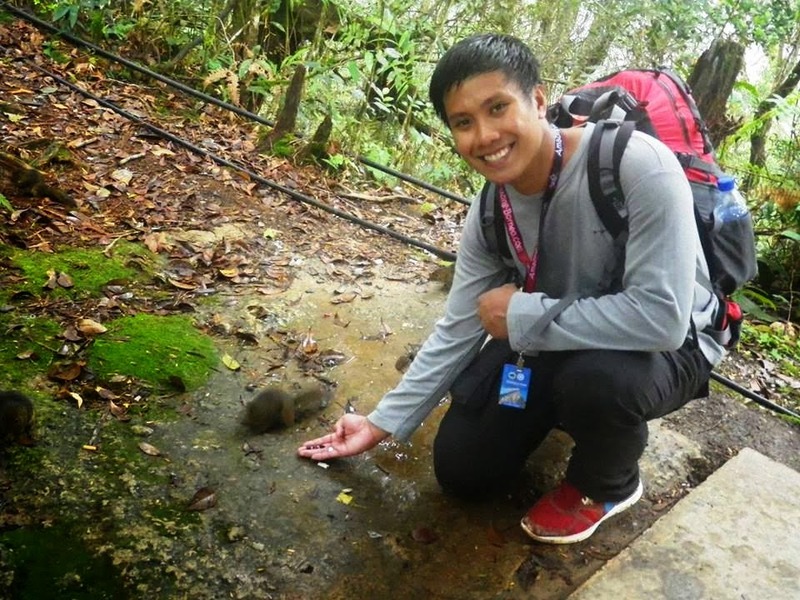 The second part of this is a 30-minute jungle trekking and finally another series of descent via ropes. They say this series is one of the portions in Walk the Torq. 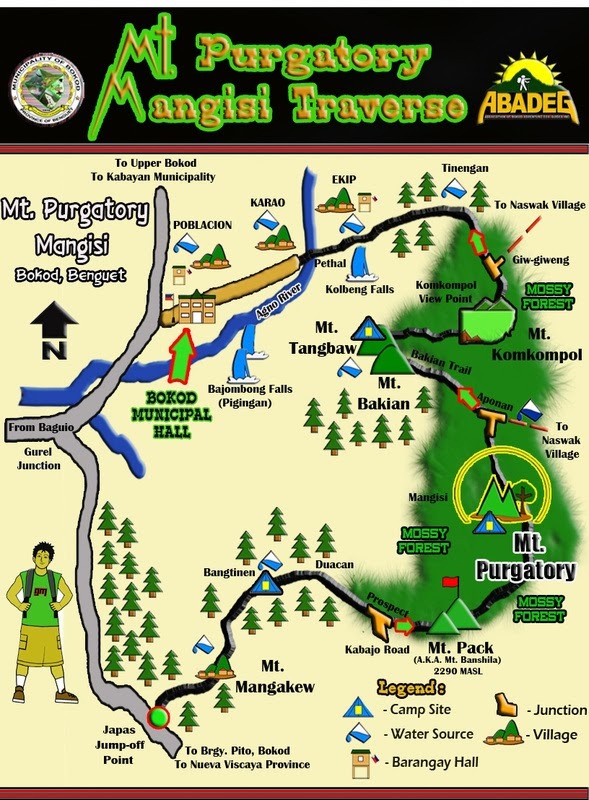 Because of the tiredness, I asked the guide if we can skip this one and descend via easier alternative trail. But we had no choice! We still had to do it in order to reach back the Pendant Hut. All of us was almost drained in strength and thank God we were able to complete it on an average duration (7:30am to 11:30am). From the last point of Low’s peak circuit was around 15minutes trek and we could barely move our legs. We were so thankful to the guides for taking care of us and we also enjoyed their company. We ate our very late breakfast (or shall I say BRUNCH – breakfast and lunch) and took some nap to regain our strength. We packed up. I drank 2 more cups of sabah tea, before leaving at 2pm. It was raining during our descent. We were so tired that we didn’t entertain anymore the traverse thru Mesilau. All that we wanted to do was to finish the climb. Paulo, Qitter and Buddy Dennis were the first to arrive and finish while I arrived at around 5:30pm. We waited for the rest and thankful to the Amazing Borneo van for fetching us. It was already dark. 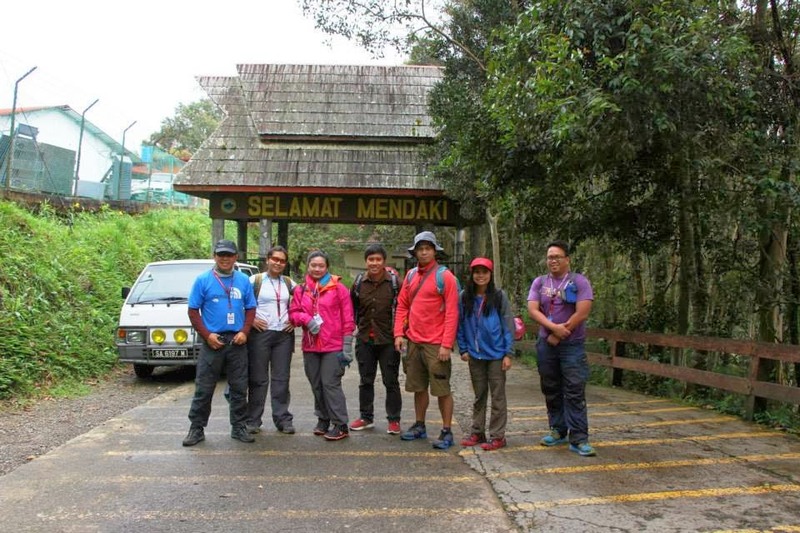 Our tiredness was relieved when we got our certificates for completing the Kinabalu climb and Ferrata. We traveled back to Kota Kinabalu city and arrived at 9pm.